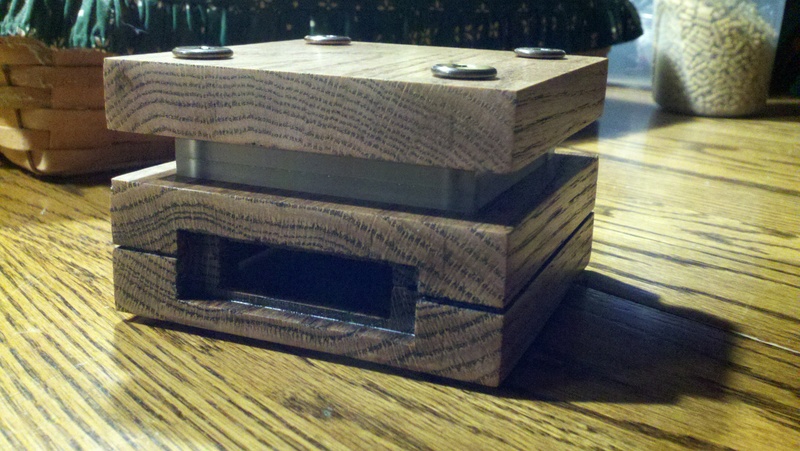 The enclosure was milled from white oak using the same design as Prototype III except the connector recess was made symmetric. The parts were arranged to have the end grain of the wood on the front and back sides- the natural wood grain pattern nicely continues the hierarchy of detail levels. Note that this was not a consideration in MDF prototypes due to their lack of grain. The oak was finished with red mahogany stain and hand-rubbed with tung oil. A shield prototype was fabricated on a Shopbot with an engraving bit using a layout generated in Kicad. 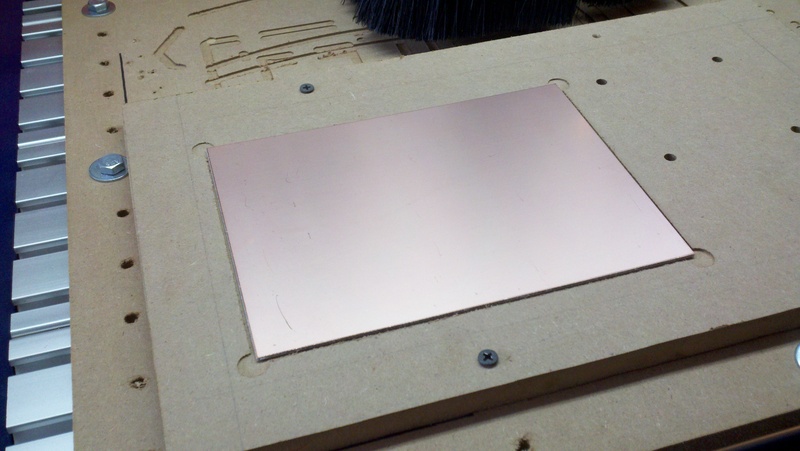 A jig was created for PCB milling using MDF. A shallow pocket (0.040″) was milled to ensure the PCB (mounted with double-side tape) was truly perpendicular the the Shopbot Z-axis. A 5 mil engraving bit was used to route around the PCB traces (separating them from the ground plane). The routing opening was, in general, too narrow and required a lot of careful soldering and X-Acto knife clean-up. 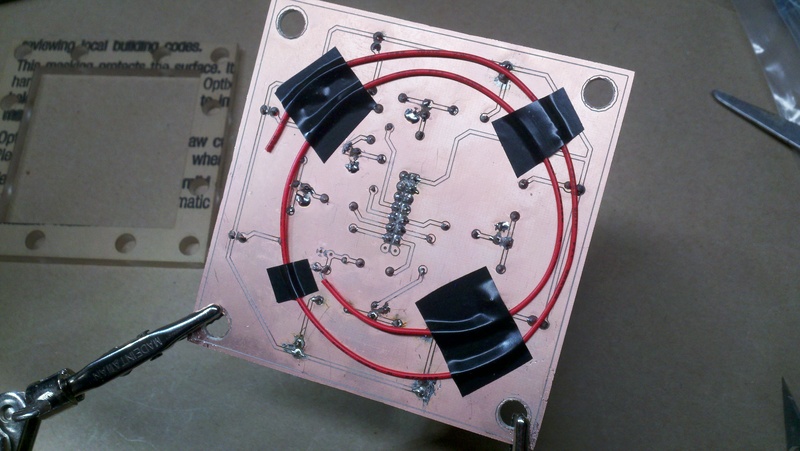 The next PCB will use wider routings! 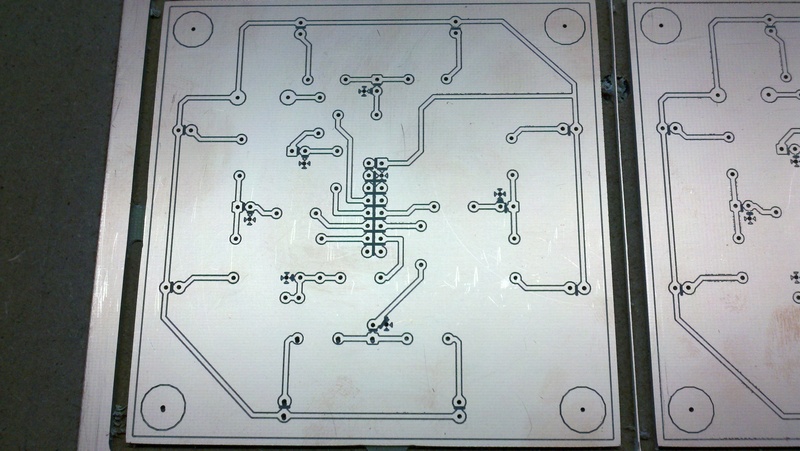 This is a single-sided board with components mounted on the non-copper side of the board. 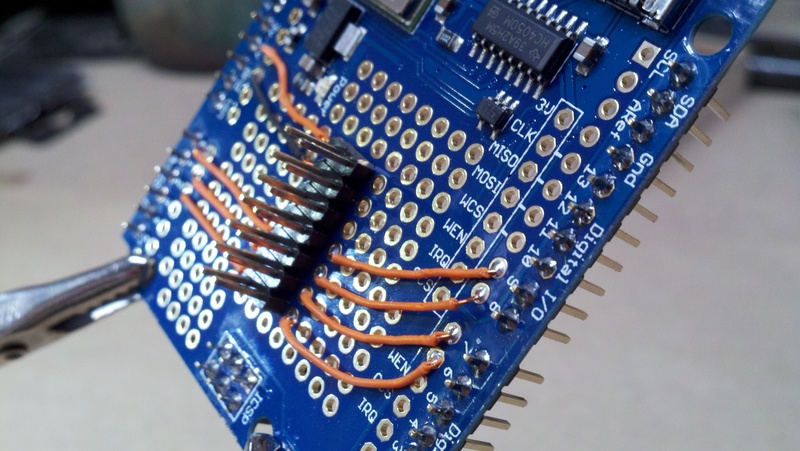 This was then changed to have lugs on each of the connecting bolts which were then tied back to the touch sensor pin. The connecting bolts then serve as a touch plate. The Arduino Uno / Adafruit WiFi shield stack was then mounted on the bottom plate using nylon spacers between both the bottom plate and the two boards. 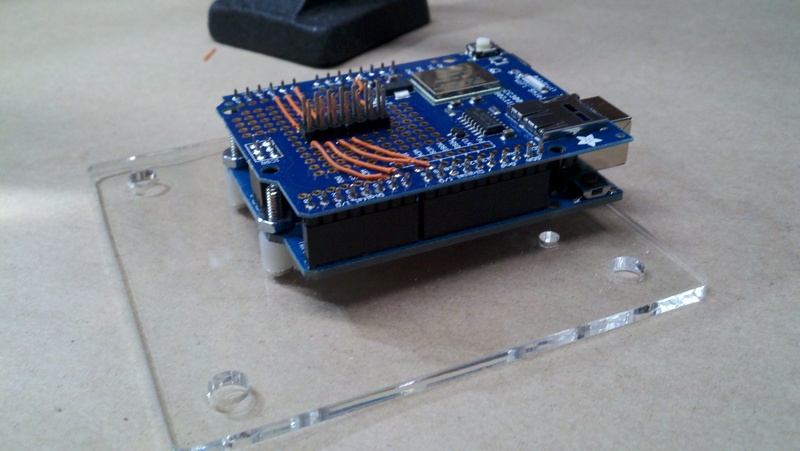 This solved the issue of lack of room for mounting nuts with just the Arduino Uno. 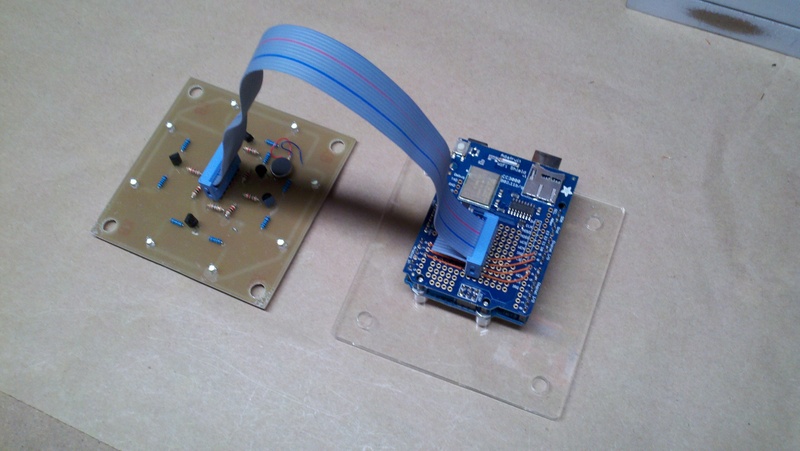 The standard Arduino Capacitive Sense library was used (nice piece of code) for the touch sensor. As noted above, the touch plate is formed from the four connecting bolts. It was noted that there could be cross-talk between the touch sensor and haptic motor drive lines- this can probably be resolved with a combination of resistor value change in the capacitive sense circuit and software timing. This was not pursued since the next prototype will try using the Spark Core mounted on the Aspect shield. The translucent plastic stack lights up well and the polish of the laser cut edges is a nice contrast the wood grain. The grain gives the enclosure a very natural and somewhat rugged feel. PIVOT: In Prototype V, investigate using the Spark Core to mount directly on the Aspect shield and provide Arduino functionality AND WiFi in one small package- quite neat!